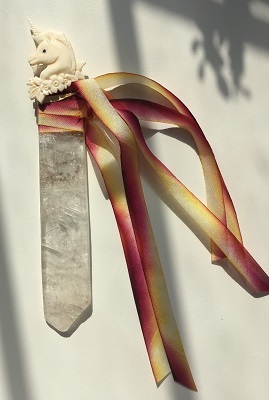 Burgundy and cream colored hand-dyed silk ribbons wrap around a natural Selenite blade topped by a magical unicorn. Selenite Crystal wands are excellent healing tools for facilitating chakra balancing, emotional healing, and spiritual development. Selenite Crystal wands are energetically cleansing, protective, and may stimulate and activate the human energy field. 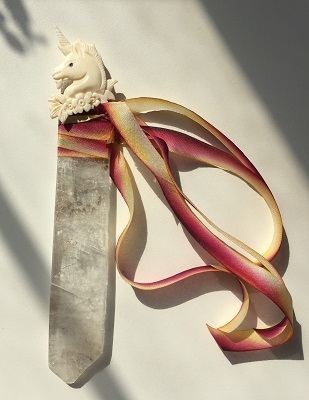 This natural Selenite crystal wand measures approximately 6”/ 154mm in length is topped by a unicorn totem. 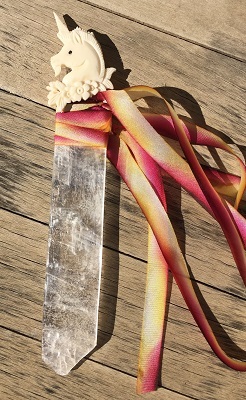 This Selenite crystal wand is a useful crystal tool for divination and angelic channeling. Selenite’s vibration energetically resonates and helps to connect one with their angelic and spirit guides for information and guidance. Selenite may be placed as part of a protective grid creating a safe, quiet space and peaceful environment. Selenite helps one with focus and gives one strength and clarity when making decisions. Selenite aids in overcoming stagnation in one’s life. Selenite allows one to be aware of the smaller details, as well as, the overall, bigger picture of a situation or opportunity. In healing, Selenite aligns the spinal column and promotes flexibility, guards against epileptic seizures. Selenite may also help clear sinus, eye, ear and nose infections.